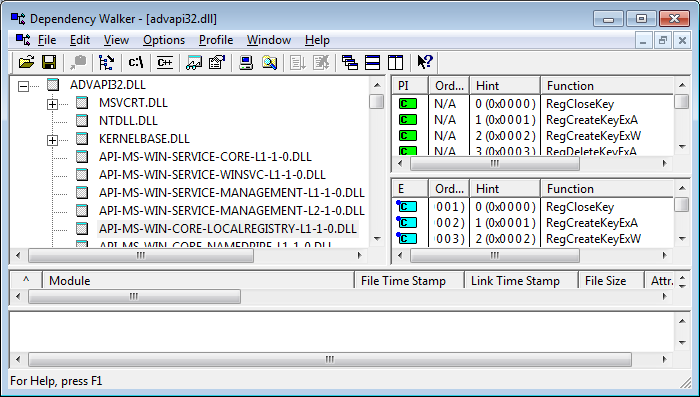 By looking in dependency walker utility, we can see that advapi32.dll, kernel32.dll, and other system dll files, are now statically linked to these empty api-ms-win-core files. So if RegDeleteValueW in ADVAPI32 and other functions simply jumps to empty functions, how is it possible that these functions still works properly ? The answer is pretty simple: When Windows loads the dll files, all the import entries of these api-ms-win-core Dlls are replaced with a call to a real function in Windows kernel. So here's our RegDeleteValueW example again: when loading a program into WinDbg, we can see that the jmp call now points to kernel32!RegDeleteValueW function. That's because during the loading of advapi32.dll, Windows automatically replace the import entry of API-MS-Win-Core-LocalRegistry-L1-1-0.RegDeleteValueW to the function address of RegDeleteValueW in kernel32. In previous versions of Windows, most of the kernel32 functions called to their corresponding functions in ntdll.dll. Effects on existing applications - compatibility issues. Most of the existing applications should not be affected by this kernel change, because all standard API calls still works the same as in previous versions of Windows. However, there are some diagnostic/debugging applications that rely on the calls chain inside the Windows kernel. These kind of applications may not work properly in Windows 7. My own utilities, RegFromApp and ProcessActivityView failed to work under Windows 7 because of these changes, and that what led me to discover the kernel changes of Windows 7. These utilities problems already fixed and now they works properly in Windows 7. Finally, here's the list of all core dll files added to Windows 7 and the functions list that each one of them contain. I used my own DLL Export Viewer utility to generate the list.